With more than two decades of Software Development experience in general and several years of RoR developments, we consider ROR as one of our important domains of expertise. For those looking to develop a social networking website, E-commerce website or content management website, we believe that Ruby on Rails is the ideal choice. Representational State Transfer (REST) for web services. Supports the major databases (MySQL, Oracle, MS SQL Server, PostgreSQL, IBM DB2, and more). Open-source server side scripting language. Scripts generators to automate tasks. Use of YAML machine, which is a human-readable data serialization format. We have the capability to build Ruby on Rails technologies. However Ruby and Rails are just not the only technologies that are required many a times to build systems for our clients. We use a variety of technologies which are necessary from time to time and project to project. The following are some of the technologies that we use. No project is successful without defining processes to ensure all information is available between the stake holders. Even though we believe in a process does not mean that our clients also believe in the same. That’s why our first motto is to adhere to client's processes and implement them accordingly. However given a chance to utilize our processes and methodologies, the following are the best in industry methodologies that we use. This relates to how we handle the project life cycle and identification & implementation of the features in a Ruby on Rails application. We follow Agile and Scrum Methodology for the projects where our clients want us to use our methodologies. Discussions at short terms help in bringing the project on track. Simplicity and Self organizing Teams. Everyone knows what to do. Scrum is divided into interative elements called "SPRINT" which is typically a two to four week period. During this period the team creates a potentially shippable product increment. The features that go into a sprint come from a "PRODUCT BACKLOG" which is a document that maintains all the features to be implemented in the product. A Scrum typically starts with a sprint planning meeting and the outcome of the planning meeting is the "SPRINT BACKLOG" and the Sprints. Once the Sprint has started on a daily basis a SPRINT MEETING is held to identify the work done and to be done for that day. This will help the Scrum Master to understand the current status of the project and any potential issues that could occur. 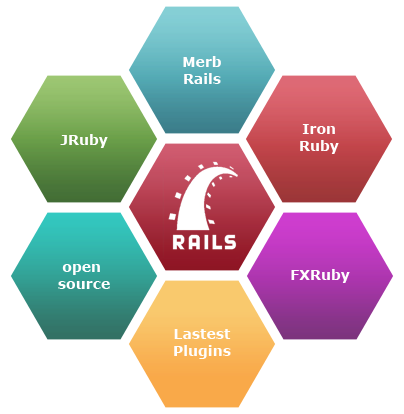 Ruby On Rails in its latest version have been promoting Behaviour Driven Development by means of RSpec, Cucumber, Webrat, Capybara, etc., tools. These tools make excellent support in writing clean and easy understandable tests which at times even the non-programmer can write them. All we do is build Ruby on Rails. 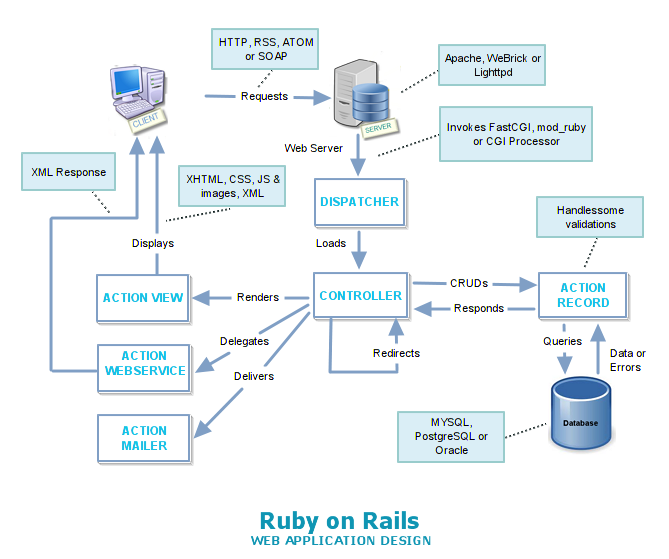 However it is not just Ruby on Rails that we build, using the base of Ruby, we can build many applications for you. In the last 5 years, we have built more than 25 websites / applications on Ruby / Ruby on Rails. Our experience in building web applications falls into the following categories. EffOne’s RoR development team deploys Ruby on Rails using database servers such as Apache or MySQL. Our developer teams provide a faster development process using the latest version of Ruby on Rails. EffOne’s RoR development team deploys Ruby on Rails using database servers such as Apache or MySQL.